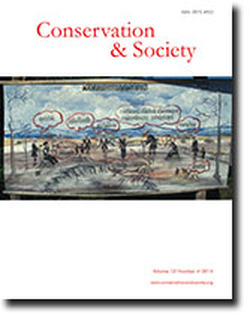 Conservation & Society (www.conservationandsociety.org) is a peer-reviewed interdisciplinary open access journal dedicated to the advancement of the theory and practice of conservation. The journal draws on both natural and social sciences, and covers basic and applied research in areas including but not restricted to political ecology, environmental history, anthropology and sociology, human ecology, conservation policy and governance, human-wildlife conflicts, ecosystem structure and functioning, systematics, community and species ecology, behavioural ecology, landscape ecology, restoration ecology, and conservation biology. The journal publishes submitted and commissioned articles, debates and discussions, editorials, book reviews, comments and notes, and reader feedback. Conservation & Society is of interest to academics, researchers, teachers, naturalists, policy makers, planners, and resource managers. It aims to serve as a bridge between conservation practitioners from a wide array of disciplines and therefore seeks to disseminate work presented in an integrative and simple manner that is accessible to individuals from disciplines ranging from the natural and social sciences to the humanities. The journal accepts articles addressing conservation issues the world over, with a focus on developing countries. Conservation & Society is published quarterly, and all articles are available online in the html, PDF, mobile, Epub, and eBook formats. The journal was launched in 2003 through Sage Publications, with Kamal Bawa as Chief Editor and Vasant Saberwal as Executive Editor, ably supported by Amita Baviskar, R. Umashaanker, Mahesh Rangarajan, K. Sivaramakrishnan, Arun Agrawal, and others. In 2005, the baton of the Executive Editor was passed to Kartik Shanker (Indian Institute of Science, Bangalore), who was joined by Daniel Brockington (University of Manchester, UK) and Heather Goodall (University of Technology, Sydney, Australia) in 2009; Lisa Campbell (Duke University, USA) in 2011; Bram Buscher (Erasmus University Rotterdam, the Netherlands; now Wageningen University, the Netherlands) in 2012; Nitin Rai (Ashoka Trust for Research in Ecology and the Environment, India) in 2013; and Haripriya Rangan (Monash University, Australia; now University of Melbourne, Australia) in 2014. ATREE has financially supported the journal since its inception in 2003. When the journal became open access under the Creative Commons License in 2005, ATREE also took the role of managing and publishing the journal. Since 2009, the journal has been managed by ATREE and published by Medknow Publications (now Medknow Wolters Kluwer). 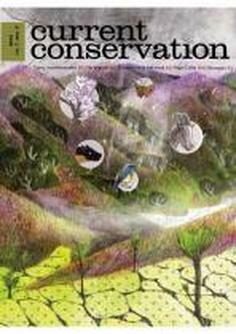 ​​Current Conservation communicates conservation-related issues and science in an accessible manner to a wide audience. The magazine carries the latest in research concepts and news from both the natural and social science facets of conservation, encompassing ecology, conservation biology, environmental history, anthropology and sociology, ecological economics, and related fields of research. Our articles are illustrated with uniquely stylized artwork, info-graphics and photographic images from contributors across the world. The magazine targets interested members of the general public, who can subscribe to the hard copy for a nominal fee. CC is published by Dakshin Foundation and supported by ATREE, DBT, DMNCT, FES, NCBS, WCS, WIPRO and WWF. Current Conservation has recently launched CC Kids, a section aimed at middle school children. With support from WIPRO and DBT, CC will go out to over 1000 schools and colleges.